Tea Gardens services the area between Raymond Terrace & Taree, in Tea Gardens Industrial area on the NSW east coast. Tea Gardens Battery Store is the showroom which displays over 1,000 different accessory lines. 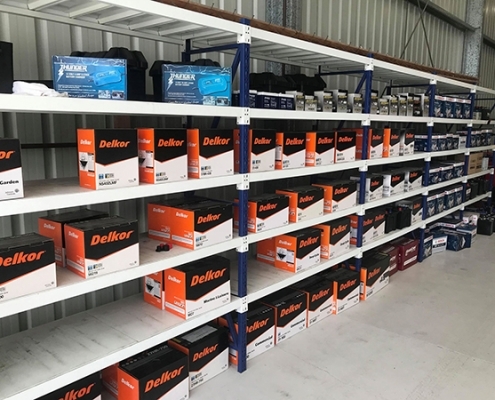 Tea Gardens Automotive is renowned to be one of the best stocked stores in Australia. Automotive batteries, batteries for phones, cameras, toys or torches, no matter what you need they’ll have it or get it for you. One Stop Shop, They can not only supply the right part but can fit it correctly. National Warranty & back up service. Pictured are a few accessories available from the Tea Gardens Auto team. Including Heavy Duty battery trays, Impact resistant lead lights, electrical components for 4WDs & the Yuasa, Overlander Battery which has been claimed the best battery for harsh conditions. The brands sold & installed are all of the best quality. This ensures true value for money, long & hassle free operation. Dual battery systems are one of the most important parts of your 4WD auxiliary electrical system. Lighting accessories available include Hella’s new driving light range that has extra strong mounts for longer life. Hella’s extra bright halogen globes which gives you better night vision without consuming any extra power. The new LED trailer lights are designer to fit & forget, they withstand vibration & are submersible, great for camper & boat trailers.